Dermacolor Camouflage Creme is an especially highly pigmented make-up which is designed to correct and cover skin disfigurements, discolorations and tattoos. Dermacolor Camouflage Creme is especially suitable for face and neck. With proper use of the Dermacolor Camouflage System skin abnormalities can be easily corrected. Once Dermacolor Camouflage Creme is fixed using Fixing Powder and Fixing Spray from Dermacolor it will be waterproof and protects the skin against damaging UV radiation. Dermacolor Camouflage could last even under extreme conditions like swimming, heat and physical strain. Dermacolor Camouflage Creme is available in an extensive range of shades and those are intermixable which gives the make-up a natural appearance when applied correctly. Those refills can be used individually for refilling Dermacolor palettes of 6, 12 and 24 colors. ECARF certified. 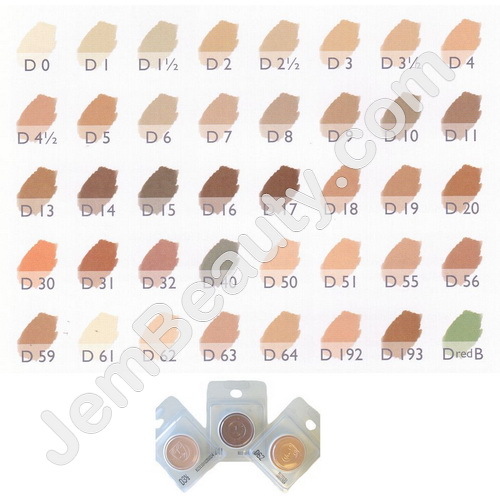 DredB - is a green shade that neutralizes reddened skin according to the principle of green + red = brown.